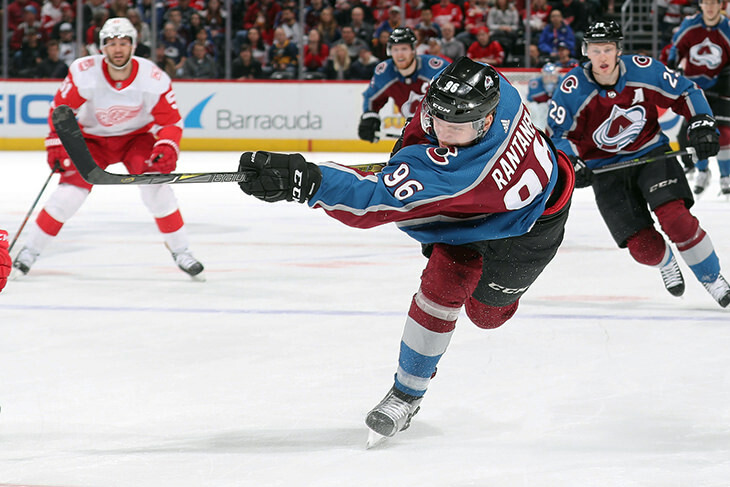 With an NHL-best 11 goals, 34 assists and 45 points in just 27 games, Mikko Rantanen has been a huge factor in the Vegas Vipers ascent into 2nd place; the late 3rd round draft pick collecting two more assists on Sunday, his Vipers team finally removing the heavy six-match losing streak from their shoulders. The Vegas Vipers still have work to do but their future is looking up, the must-win win leaving the team with a record of 3-6; three games shy of the Grimson division-leading Wild Ducks. The Central Red Army meanwhile are looking for anything on which to hang their helmet, the team now seated at the bottom of both the overall and Domi division standings; their 3-6 record (and their 12th place home) in need of an immediate overhaul. The SC Cobras padded their overall lead in Week 9, GM Murphy's squad now 25.0 points better than the rest. The Cobras also saw their H2H prospects improve - the snakes rising above .500 for the first time this season - their 5-4 mark leaving them just one game back of the Domi leader. Badger Bob’s record took a hit, the 9th place team now 5-4 on the year; one game behind the Wild Ducks in the Grimson. After dipping their toe in the basement during the week, the Bobs begin Week 10 on level ground, the defending champion currently lodged in 9th place. The Boulder Flyers won this battle of division leaders, the team remaining the sole owner of the Probert division lead with a record of 6-3; one victory better than the Ice Hogs. The Misconducts lost for just the third time this season, the veteran franchise still nestled on top of the Domi division - though their lead was shaved by a game, the Cobras now breathing down GM Smalley’s neck. Overall, the Flyers depart the week in 3rd place; the Misconducts in 5th. The Ice Hogs roared past the Polar Bears on Sunday, GM Henry’s squad keeping pace with their division leader; the Hogs remaining one game back in the Probert with a record of 5-4. Overall, the Hogs are poised to pounce, seated in 4th place, just 33.0 points back. The Polar Bears were again dispatched to the basement of the Grimson, a subpar 3-6 mark leaving the Bears three full games behind the division-leading Wild Ducks. The Cup-chase standings find the Bears in 7th place, 47.1 points back. The 6th place Wild Ducks used Sunday to blow past the Ice Cats, GM Collard’s squad improving to 6-3 with the win; a record that provides the team with a one game Grimson division lead. Heading into Week 10 the Ice Cats are still searching for answers, GM Cutshall’s squad currently seated in the Probert basement with a record of 4-5; the Cats also perilously close to the FHL basement, the 11th place team just 0.6 points better than the last place Army. Injuries continue to take their toll on GM Hamilton’s squad - Filip Forsberg the latest Bluliner carted to the shelf - the B's tumbling into 8th place overall; the last place Probert division team now 4-5. Concussion Junction meanwhile is basking in their 4th win of the season, GM Brendan’s squad moving into 3rd place in the Domi, just two games behind the division leader. With regard to their FHL Cup chances, Concussion is more Junktion than Junction, the 10th place team a distant 78.8 points back.